The unexpected occurred last night: The UK voted to leave the European Union (EU). Global markets are reacting swiftly to this announcement, punishing stock prices around the globe and swinging currencies wildly. Although the markets were predicting a UK “stay”, this vote was always a very close race, with voters divided and the polls only a few points apart. This initial market response this morning is not surprising, but is being driven more because the markets had priced in the opposite happening, not because company valuations have dramatically changed overnight. Last night’s vote is specific to the UK, but it raises questions about the long-term viability of the EU, as more “change” elections could be coming in Spain (2016), Germany (2017), and France (2017). It is not a quick process to leave the EU (there’s a two- year negotiation period), but that does not matter for markets. Prime Minister Cameron has already announced he will step down, and will resign officially in three months. The UK is likely to have its debt downgraded. Liquidity will be key in the short term as the Bank of England and central banks around the world are expected to respond with additional easing. The probability of a UK recession has increased. We believe this is a buying opportunity, as overreaction is common when markets experience unexpected news of this magnitude. Europe, and particularly the UK, is on sale right now. The British Pound is down over 11% versus the Dollar, a 30-year low. This news is dragging US stocks lower too, a sign that correlations remain high in the developed world. We expect there will be a premium on security selection in this environment, and perhaps particularly so in the international developed and emerging markets. Active managers typically focus on higher quality companies, which tend to outperform in times of uncertainty and market retrenchment. This year we have already seen a decline in correlations across stocks, reversing the trend of the past couple of years. The market's reaction to the UK leaving the EU should further support that trend. Quality - Stocks in a strong financial position (e.g., companies having low leverage, strong cash flows, high ROA) outperform. Low Beta - Historically, low beta stocks outperform high beta stocks, and especially so in volatile markets. Low Idiosyncratic Volatility - Stocks exhibiting low volatility outperform high-volatility equities. The outcome is generally good for investors holding fixed income paying lower yields. These types of “risk-off” reactions to changes to the status quo are normal, and we’ve seen these situations play out many times in the past. Our strategic allocations are designed to provide ongoing exposure to a diversified set of asset classes. Timing the market is very difficult, especially in the middle of a crisis where normal valuations give way to panic and uninformed decisions. Staying the course and remaining invested with a long term view is usually the optimal course of action. In unexpected and volatile times like these, the value of professional advice is apparent. Guiding and coaching clients to stay disciplined in their investment plans through market cycles, good and bad, is a vital skill. 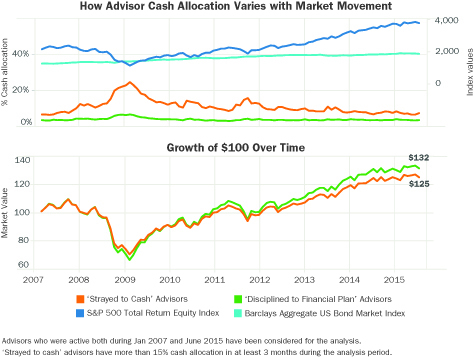 Envestnet data revealed that portfolios of clients whose advisors persuaded them to remain invested during periods of market stress outperformed those of investors whose advisors increased their allocation to cash. In addition, the practice of rebalancing helps portfolios reduce volatility and enhance risk-adjusted returns. Rebalancing can potentially bring higher return and lower downside capture of the market, compared to a portfolio that is not consistently rebalanced. Finally, as a committed partner to advisors, Envestnet invests heavily in its infrastructure and ability to scale—including the platform’s capacity to execute operations under heavy periods of transaction volume and account administration across all user types: advisors, strategists, middle- and back-office users and home offices. Important areas of our investment focus have been in the intelligent automation of model instructions and service requests, where the technology separates work items that do not require any review, and processes those, while segregating the items that need operational attention. These jobs are optimized and sequenced to maximize the trading window and increase trade execution throughput, despite slow execution in the upstream systems of the marketplace that high volume creates. Envestat, Envestnet’s industry analytics engine, delivers regular digests of business intelligence designed to provide context to the decisions that financial advisors and enterprise business owners face every day. While the regular digests provide insights that revolve around a quarterly theme, our quarter-end INTERSECTION connects these insights to highlight the significance of the quarterly theme and its impact on advisory practices. The data provided is derived from Envestnet user data composite. Data has not been independently verified. The information, analysis, and opinions expressed herein are for general and educational purposes only. Nothing contained in this report is intended to constitute legal, tax, accounting, securities, or investment advice, nor an opinion regarding the appropriateness of any investment, nor a solicitation of any type. All content posted to the Envestnet Institute is subject to the Terms and Conditions as outlined. Envestnet is not responsible for third party advisor content posted on this website; however, Envestnet does retain the right to edit or remove such postings. Envestnet Institute is not a regulated entity and is intended for Investment Professional/Financial Institutional use only.